The Sansha Pro# 1C ballet flat is a lighter FleshTone shade. It is slightly darker than the Capezio Freeform, but the hue itself is quite different. It could best be described as a camel colour with peachy undertones. The elastic straps need to be fitted, and the sizing can be quite tricky — so it’s best to try these before you buy. The shoe is breathable canvas and the split sole is fully hand stitched. 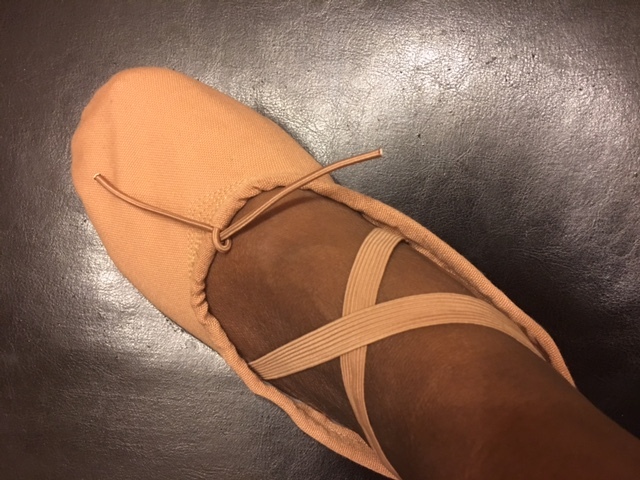 The Pro #1C is lightweight and double-lined for durability, though the shape itself is possibly not as complementary as the Freeform or other standard ballet flats. However, if properly sized and fitted, these will do the job. I had heard mixed reviews on these when I first got them, but so far, so good. Make sure you get the sizing right when you order, and I also reinforced the elastic when I first got them and haven’t had any problems. Super comfortable. I’ve always worn Sansha as it’s better value for money than Bloch or Capezio. I like the Pro 1C – though I do find the shape of them are not immediately great – they width I ordered was wider than expected and I really hate sewing my own elastics on! But otherwise a great rehearsal shoe. I think they would suit a lighter to medium tone dancer even though the color has a bit of a ‘blush’ about it. It would be nice if they made these in brown!